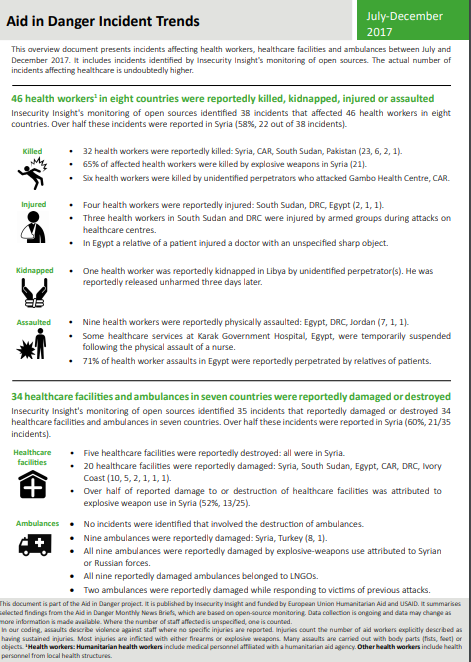 Health care workers and health facilities are frequently targeted in conflict zones. We monitor open sources for a wide range of events that interfere with the delivery of health care. 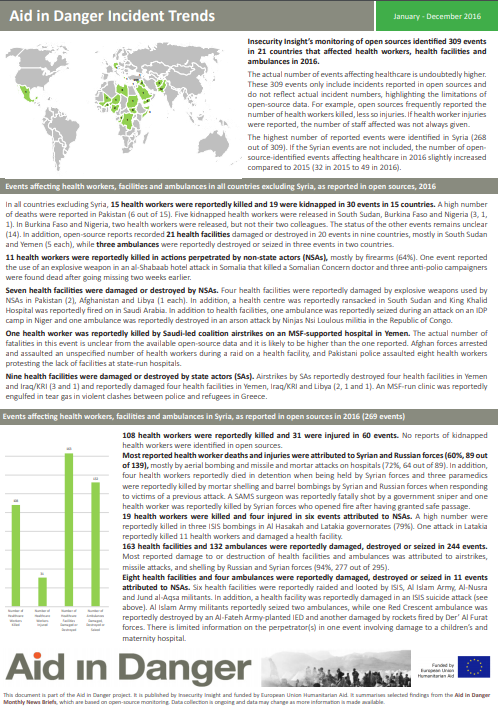 We compile the data for the Safeguarding Health in Conflict Coalition report. 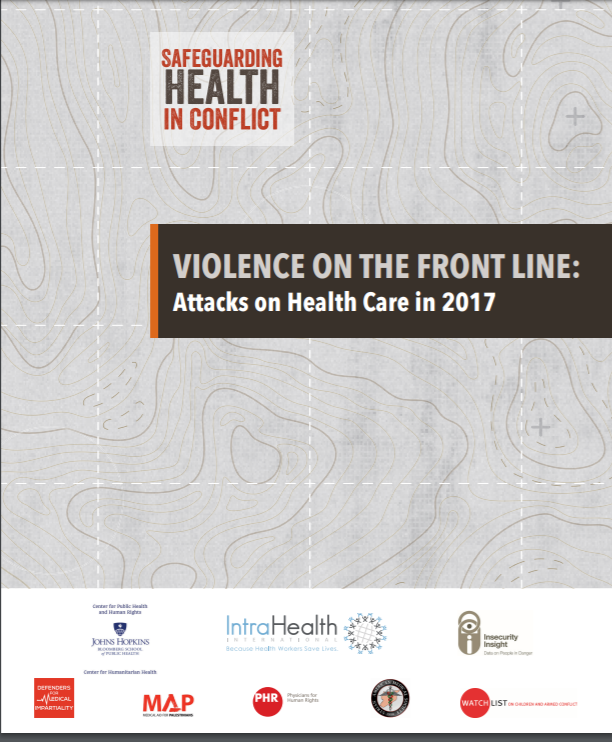 In 2018, we documented a total of 973 attacks on health in 23 countries in conflict for the Safeguarding Healthcare in Conflict Coalition. 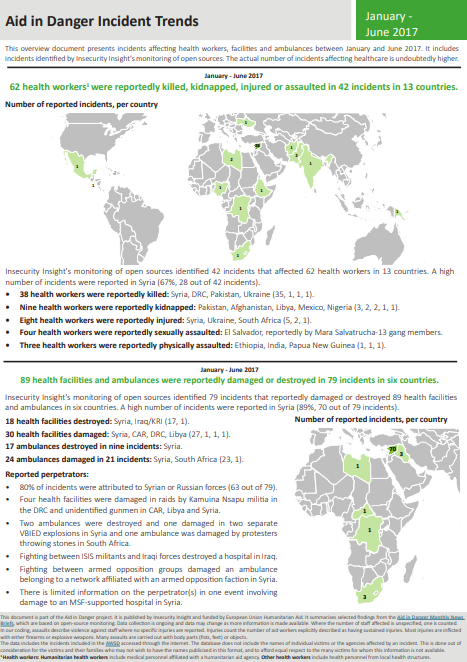 More than 150 workers died in these attacks in 16 countries and almost 700 were injured. Vaccinators were attacked in seven countries. Hospitals and clinics were bombed and burned in 17 countries. Aerial attacks that hit health facilities continued in Syria and Yemen. Read the new SHCC report 2018 when it comes out in May. 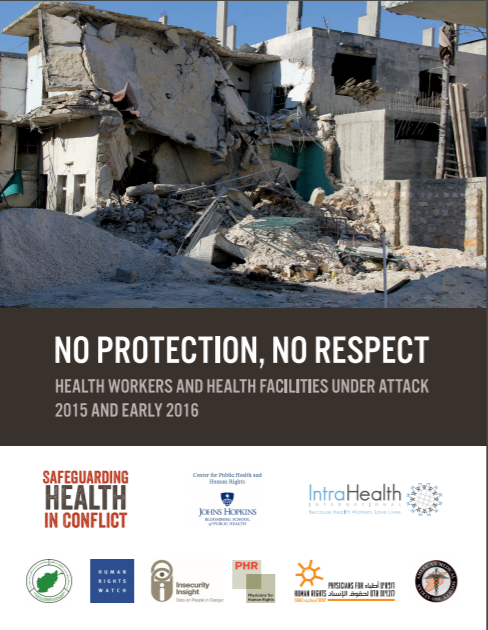 In May 2016, the UN Security Council adopted Resolution 2286, which set out a road map to protecting healthcare in conflict; but attacks on health workers and facilities continue to occur with devastating consequences for people in affected areas. 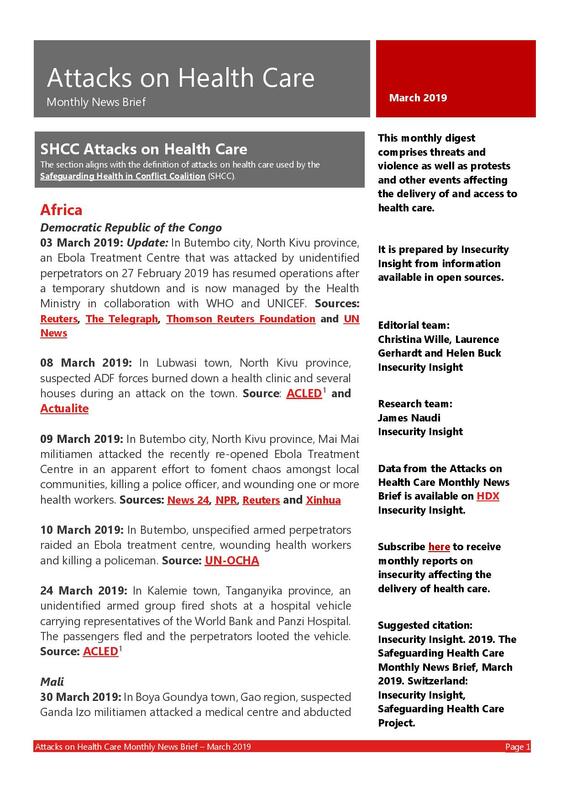 We monitor open-source reports on attacks on health care and work with a wide range of partners to support awareness and policy change for better protection of health care. We are part of a consortium that researches the impact of attacks on health care at the University of Manchester. Read our Monthly News Briefs on open-source information on attacks on health care. Selective quick charts and datasets are available on the Humanitarian Data Exchange (HDX). Join our mailing list to receive all publications straight into your inbox. 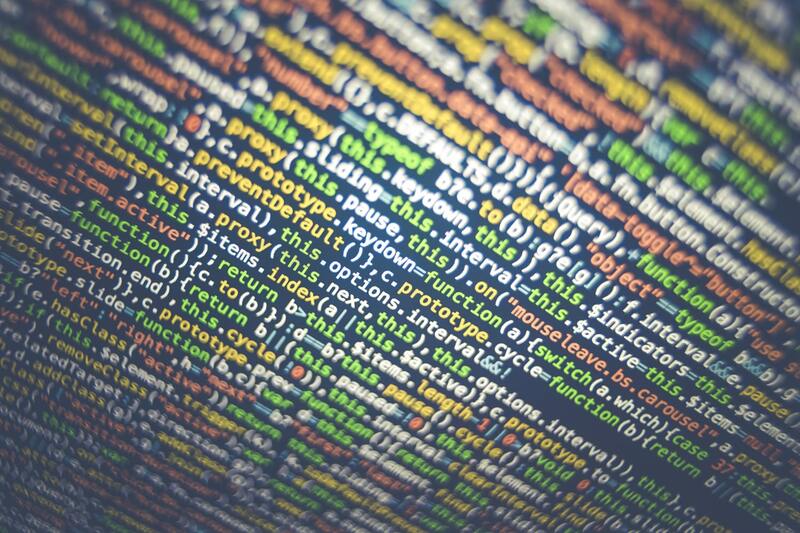 Global safety, security and access incidents affecting health care. 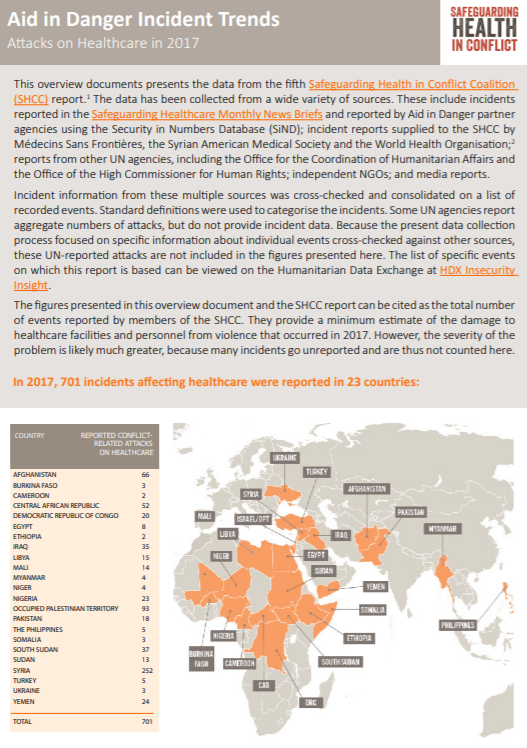 The fifth SHCC report documents 701 attacks on health care in 23 countries. The fourth SHCC report documents attacks on health care in 23 countries. 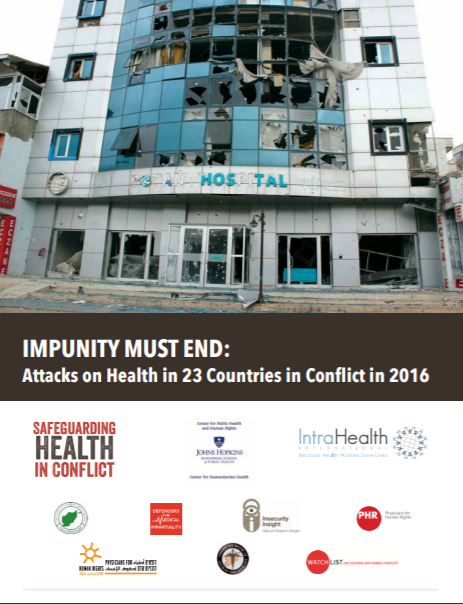 The third SHCC report documents attacks on health care countries in conflict. 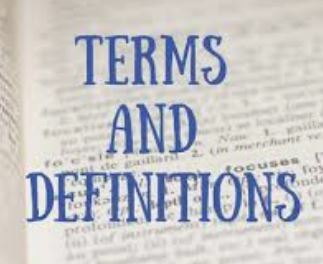 Find out about the digital tools we use and are developing.